For more information about an adoptable pet, click on the pet's name or picture in our pet list to go to our Petfinder website, read all about the pet, and watch the pet's video. Our pets are also on the Adopt-A-Pet website. 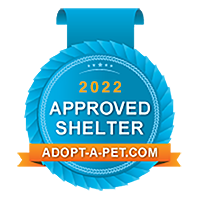 We have received their "badge of approval", which states that the Pet Refuge has passed an initial screening process and been approved by Adopt-a-Pet.com. You can also contact the Pet Refuge at (401) 294-1115, or send an e-mail to petrefuge@verizon.net or animalz@cox.net for more info about adopting a furry friend. Print the PDF or Microsoft Word version of the application, fill it out by hand, and then bring it with you when you visit the Pet Refuge. To print it in PDF, you must have the Adobe Reader software. Click here to download a free copy of Adobe Reader from the Adobe website. Open the Microsoft Word version of the application, type your answers on it, and select the appropriate checkboxes. (NOTE: To select or de-select a checkbox, double-click on the checkbox and then select the appropriate option.) Save the application and e-mail it as a file attachment to petrefuge@verizon.net or animalz@cox.net. You can also fax the application to us. Our fax# is 401-294-4963. Purebred and special needs cats have special pricing.